At the 11th annual Telecom Review Leaders’ Summit, An Jian, President of Carrier Network Business Group at Huawei Middle East, delivered a keynote on the theme “5G Inspiring the Future” to highlight the progress made in the Middle East on 5G. Held at the Dubai Meydan Hotel on December 10th and 11th, the Telecom Review Leaders’ Summit was a platform for high-level industry and government leaders to discuss how the ICT industry can support the successfully realization of government plans for economic growth and development. 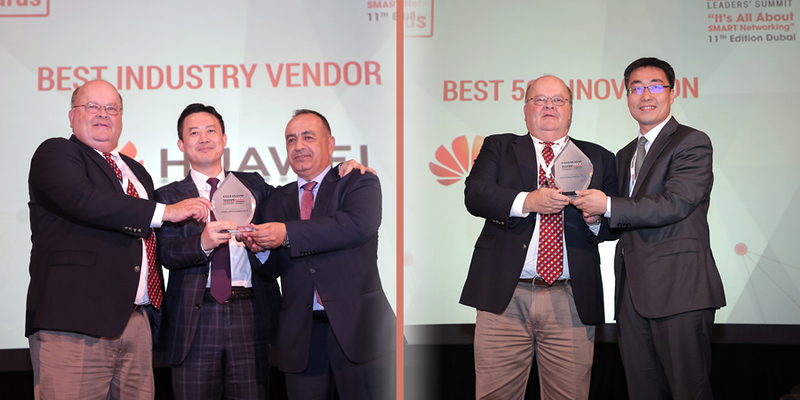 In recognition of the outstanding contribution to building an innovative ICT ecosystem in the Middle East and the role played in positioning the region among the global pioneers in 5G; Huawei received two awards “Best Industry Vendor” which was accepted by Charles Yang, President of Huawei Middle East, and “Best 5G Innovation” which was accepted by An Jian, President of Carrier Network Business Group at Huawei Middle East. According to An Jian, the 5G revolution will bring changes unlike anything humanity has seen before. In this new world, connectivity will be a platform and not a pipe. By 2025, Huawei predicts there will be 100 billion connections. Everything will be online: 5G will enable 40 billion smart devices to be constantly connected. The cloud will be the backbone of this new ICT world, leading to intelligent on-demand for everything, everywhere. According to Huawei, thanks to 5G’s ultra-high connectivity and ultra-low latency, by 2025 100 percent of enterprises will be using cloud, and 86 percent of enterprises will be using AI. In the Middle East, An Jian predicted that Fixed Wireless Access (FWA), Cloud PC, Cloud Gaming, Cloud AR/VR, and connected drone will be the first sectors to feel the impact of 5G driving industry progress. This year alone, Huawei has already shipped over 10,000 5G base stations, evidence that 5G progress is accelerating. The Middle East is leading the way: over 7 countries and 15 operators in the region have launched 5G trials and field trials using Huawei’s E2E 5G systems, effectively promoting the development of 5G in the region. In a groundbreaking global milestone, in the first half of 2018 Huawei supported leading operators in the region to launch the world’s first 5G commercial network. To discuss the best path forward to bringing 5G to the Middle East, on the first day, Dr. Mohamed Madkour, VP Global Wireless Networks Marketing and Solutions at Huawei Middle East, joined a panel entitled “5G: Recalculating routes for new economic value.” On the following day, Safder Nazir, Vice President of Digital Industries at Huawei Middle East, took part in a panel discussion on the theme “Characteristics of leading smart cities” to drive forward Smart City progress in the region.